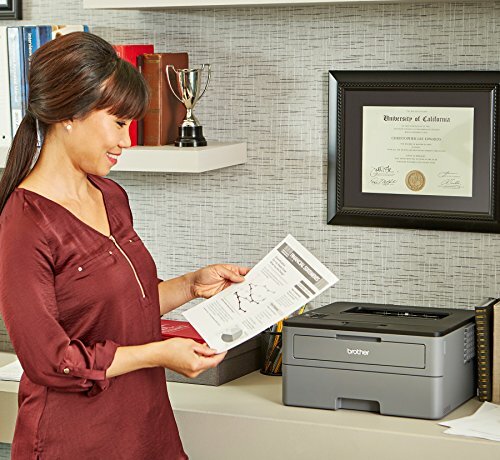 Designed for the busy home business or small business owner, the new Brother HL-L2350DW compact laser printer is an exceptional business printing solution. 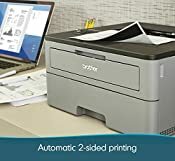 Engineered with the latest technology, this compact, yet highly diverse laser printer delivers class-leading printing speeds of up to 32 pages per minute. It also has automatic duplex (two-sided) printing capability, making dual-sided printing simple, fast, and efficient. The 250-sheet paper capacity allows busy business owners to improve efficiency and reduce downtime with less paper refills needed. 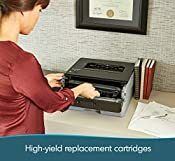 Quality is enhanced by using Brother Genuine high-yield replacement cartridges (TN-760) which can help to reduce operational costs (also compatible with TN-730 replacement toner cartridge). 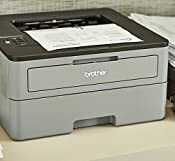 The new compact laser printer from Brother can print on both letter and legal-sized paper. It is also infused with modern wireless technology that will permit you to print from smartphones, laptops, tablets, or desktop devices. 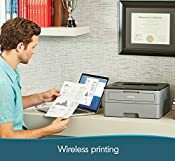 Also, a built-in wireless or USB interface offers users the flexibility to send multiple print jobs to the Brother HL-L2350DW at the same time. 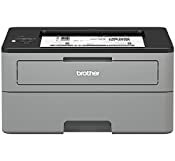 Brother is dedicated to superior customer service and stands by our products by offering a 1-year limited warranty on this new compact laser printer. We provide free online, call, or live chat support for the life of your printer. At Brother, we want to ensure that your experience with us is exceptional. 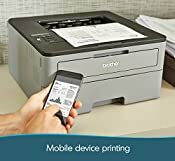 If you have been looking for an exceptional compact laser printer with fast printing capacity and multiple user-friendly features, add the Brother HL-L2350DW to your Amazon shopping cart today. (1) Based on competing in-class monochrome laser printers under 200-dollars. Print speed specifications gathered from manufacturer websites as of 1/9/2017. (2) Requires connection to a wireless network. (3) TN-760 High Yield vs. TN-730 Standard Yield. Up to two times more prints and lower printing costs based on yields and MSRP. Standard Yield and High-yield cartridges sold separately. (4) Approx. toner cartridge yield in accordance with ISO/IEC 19752 (letter/A4). (5) Reprinted from PCMag with permission. Copyright 2017 Ziff Davis, LLC. All Rights Reserved. (6) Approx. 300 pages per month in accordance with ISO/IEC 19752 (Letter/A4) using the 2 toners provided in box. (7) The mobile device must have NFC capability and run Android OS 4.4 or later.